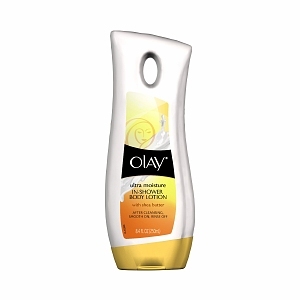 This body lotion is to be used in the shower after cleansing. Basically, you smooth it onto your skin using a quarter-sized amount per body part and rinse off after (towel dry when you get out). The product is said to work with the warmth and moisture of the shower to make your skin softer and better hydrated. You should notice smoother skin after one use and with daily use, more moisturized skin after 5 uses. It feels halfway between lotion and shower gel. Since you're putting it on while your skin is wet, it slips onto your skin easily and you're literally done putting in on in under one minute since you don't need to be careful about putting it on very uniformly. You can have a bit more in certain spots and who cares, you'll be rinsing it off! This is the part that bugged me because I hate perfume. I used it a couple months ago and didn't continue because of how perfumed it is. This would probably not bother people who don't mind perfumes but could be a deal-breaker for people who are sensitive to smells like I am. I returned to the product because my skin was feeling dry and I just didn't have time to perfectly smooth on body lotion after drying off. I normally have to run to the baby before I even get dressed after my shower so this was a try at moisturizing myself without taking much extra time and effort. And I am now OK with the scent. It definitely stays on the skin though - my husband smelled it immediately when I saw him about 8 hours after my shower and I can still smell it on myself 12h later. Does it moisturize? Final thoughts. It absolutely does! This is the answer to my moisturizing problem and is what I consider a "mom product". Not as in "Your mom would like it." but more like "If you're a busy mom, you'll like it." I can't complain that I have dry skin for lack of time because this stuff takes less than a minute to smooth on and rinses itself off while I finish my hair. My skin felt softer after the initial use as promised. I'm not sure I've ever seen this product in stores and from what the reviewers are saying at Well.ca, they have trouble finding it too. You can buy it though on the Well.ca website for 6.99$ (250ml) HERE. I'm only posting a link because I read that it's hard to find and because I have personal experience with Well.ca and trust them. They will ship for free in Canada with no minimum purchase (excluding far-out regions). Overall, I would recommend this product with no hesitation for people who find putting on lotion over the entire body too time consuming or annoying and who don't have sensitivities to perfume. For those who like putting on lotion after their shower and are comfortable in that routine, I don't think this would do more for your skin than your current routine. For those sensitive to smells... Depends. I don't like perfume but I still like this product a lot. Too strong scent would bug me, but my skin is quite sensitive. I've had great use of body wash oils, or when I do my weekly exfoliation, which is based on oil and leaves my skin soooo smooth. Any brand in particular that you love? I use a local brand owned by the store, so I'm afraid I can't give any specific recommendations. But for the exfoliation, you can use pretty much any oil (I've used olive, almond and coconut in the past), mixed with sugar or salt.